Coffee Coffee Coffee… one of the things that us millennials are spending money on rather than saving for our future. I have to admit, I am one of those culprits. My airbnb was right off Yonge/Dundas, and with that territory, comes a plethora of options for coffee shops. One of the ones that we decided to go to that morning was Dineen. They have a nice interior, which is lite and elegant, with a nice display for their pastries. They also have a patio that is off the main street which is good for people watching. We went with a latte and a couple of their pastries for a quick breakfast. Their key lime tart was nice and light. The lime flavour was really strong, and it was a bit over powering. The merringue on top gave some nice sweetness to contrast the other flavours but the lime flavour was like a punch in the face. 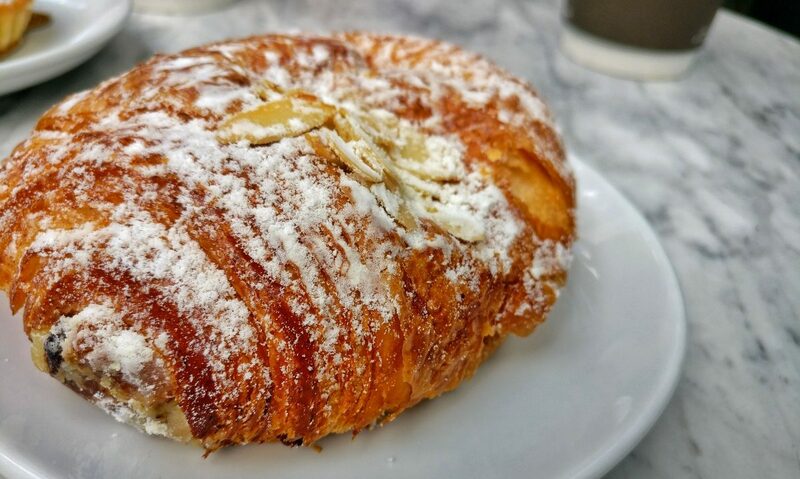 The almond croissant was flakey, buttery, and delicious. On the inside of the croissant there was an almond custard which was unexpected but added some nice moisture. As for our coffees, we both got vanilla lattes, but made by two different baristas, and they were vastly different. Mine had coffee grains all up inside the coffee and tasted dramatically different. I think there may have been an mistake made during the making of my latte, but the other latte was delicious and smooth, and not too sweet. Overall, nice little coffee shop with some tasty pastries. Nice place to catch up, grab a quick snack, and a great place for people watching.